The Core Sound Decoy Guild was founded in August 1987. The Guild was but an idea that Harkers Island natives Wayne Davis and David Lawrence had talked about for years. Being decoy carvers like many folks throughout Down East and Carteret County, the two had traveled to the decoy shows in Virginia Beach and Chincoteague, VA, and Currituck, NC, among others. They wondered if there would be enough interest to get together with other local carvers on a regular basis to swap techniques and carving tips, and possibly for this group to have a little decoy show each year. A group of seven men gathered at Wayne’s house on August 11, 1987 to celebrate his birthday, and they decided to start a carver’s guild. Between mouthfuls of stewed clams, made by Wayne’s wife, Lana, they settled on the name, the Core Sound Decoy Carvers Guild. 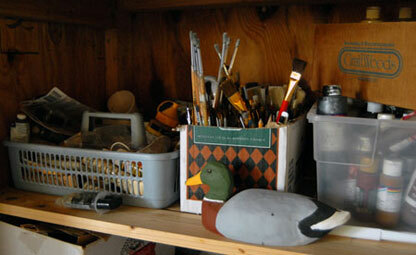 A plan was sketched out to get in touch with all the local carvers and decoy collectors they could think of and meet. The original founders of the Core Sound Decoy Guild are Wayne Davis, David Lawrence, Gregory Lupton, Curt Salter, Norman Hancock, Carl Huff, and James Gordon Salter. They voted Wayne as President, Gregory, Vice-President, and David, Secretary-Treasurer. Before the first official meeting on September 16, 1987, the group called in two additional local carvers, Roy Willis and Gerald Davis, to create the original nine Board of Directors. 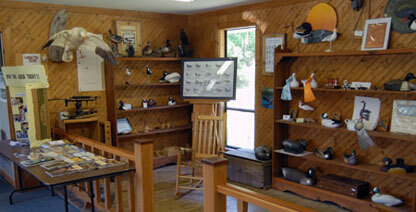 A group of about 30 Carteret County decoy carvers and collectors gathered at that first Guild meeting, meeting in the library of the Harkers Island Elementary School. Plans for monthly meetings and a decoy show were outlined. All immediately joined the newly formed Guild. With decoy shows filling nearly every weekend from August to December throughout North Carolina and surrounding states, the group decided to set the Core Sound Decoy Festival to be held the first full weekend of December. 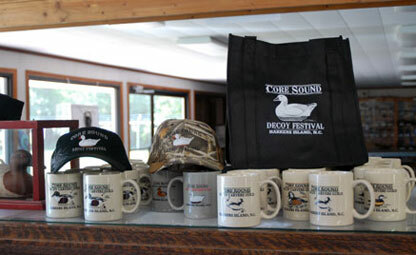 The first festival was held in 1988, and was originally called the Core Sound Waterfowl Festival, until the name was officially changed to the Core Sound Decoy Festival two years later.